On the third and final stage of the Antarctic circumnavigation, the expedition travels to remote islands and through a conveyor belt of icebergs before reaching Cape Town, its port of destination. Alex Haumann talks about his impressions, the changing water cycle, and its important role for Earth's climate system. The Southern Ocean is a pristine region of the Earth, and is considered to be the lungs of our climate system. Here, massive quantities of water move up from the depths to the surface, where they take up carbon dioxide and heat from the atmosphere before sinking down again. Were it not for this exchange, man-made global warming would be far more pronounced. One of the expedition's goals is to understand these important processes better. Which is why we're collecting water samples from the sea, the atmosphere and the ice during our journey – not an easy task in such harsh and constantly changing conditions! On the third leg of the journey, there continue to be almost 60 scientists on board, working on 22 research projects. A newcomer quickly realises that so many diverse interests can easily lead to conflict. In order to carry out the measurements for our project, I often have to walk through the ship for hours and negotiate the next stop when we can deploy the instruments in the water. For the first few days, it is simply the bad weather, rather than any conflict of interest, that confounds our painstakingly prepared monitoring schedule. Waves up to eight metres high prevent us from lowering the extremely heavy rosette with all its instruments and bottles into the sea. So initially, the oceanographers are only able to take a few measurements, whereas the atmospheric scientists have their hands full collecting rain and snow samples (see these blogs for stage 1 and stage 2). After a couple of stormy days, our first stop is the island of South Georgia. I awake to find Akademik Treshnikov in calm water, and the ship's engine to be silent. Through the cabin porthole, I glimpse the smooth water surface, mountain peaks and clear blue sky. The storm has unexpectedly moved south, and we're at anchor in the bay at King Edward Point. I accompany my colleague Pascal Graf (see his blog) to the island to collect water samples. Actually, we are searching for the same thing—the origin of water. 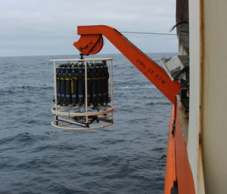 While the ETH research group led by Professor Heini Wernli is interested in the atmospheric transport of the water, the EPFL project that I'm a member of is looking for the origin of the freshwater that determines the salinity of the Southern Ocean. For this project, we need to measure oxygen isotopes in seawater, which serve as a kind of fingerprint. Once we compare the seawater samples with those that Pascal and I have collected from the island, we will be able to determine how much freshwater in the form of snow and rain reaches the sea. We now sail south from South Georgia to the South Sandwich Islands. Soon we are on the main iceberg route and surrounded by icebergs as far as the eye can reach. Some are so colossal that you could build a whole village on them! These icebergs drift northward along the Antarctic Peninsula for hundreds of kilometres to meet the Circumpolar Current; they are then carried eastward like a conveyor belt, while they gradually melt. Our ship stops at a particularly massive iceberg, and a couple of researchers fly over by helicopter to bring back ice samples. We'll compare these with the seawater samples too, in order to assess how the melt water is freshening the sea. We pull slowly away from the polar waters, sailing northward, past the lonely island of Bouvet, on course to Cape Town. Our instruments are not registering any warming of the water yet, probably because winter is slowly arriving. This would also explain the large number of humpback whales travelling north, who accompany us on the past few days of the expedition, spouting water and sporting enormous tail fins. We are now leaving behind the colossal carpet of sea ice that spreads out over large areas of the Southern Ocean every winter and is beginning to expand again. Sea ice forms from freezing seawater; in the process, the salt dissolved in the water precipitates into the ocean below. This makes the seawater more salty. Conversely, when the ice melts, it releases freshwater into the ocean, reducing its salinity. Besides rainfall and melt water from icebergs, sea ice is the third source of freshwater in this region. Using satellite observations, we showed in an earlier study how a stronger northward transport of sea ice has reduced the salinity of the Southern Ocean over the past decades (see ETH News). We now want to back up this theory with the more than a thousand water samples collected. The reduction in salinity enhances the stratification of the water and may be significant for the Earth's climate. Water with a low salinity is lighter than more salty water and floats like a lid on the surface. This prevents warmer and carbon dioxide-rich water to upwell from the depths, and results in an increased uptake of carbon dioxide and heat from the atmosphere at the surface. These are then subducted with the water to the lower layers. Only in a few months' time—once we have analysed and assessed all the samples in the lab—we will be able to assess to what extent the changes in sea ice, rainfall and iceberg melt are contributing to the decreasing salinity of the Southern Ocean. Only then will we know whether all the hard work on board the ship has been worthwhile. But one thing is already certain: the ACE expedition is returning with a countless amount of valuable data from the ocean, the atmosphere, the ice and the ecosystem. Over the coming years, this information will provide important insights into an area that is still largely unknown. As expedition members, we now own a wealth of unforgettable memories from a strange but wonderful part of the world, which although so remote, is so important for the climate of our planet.